Memorable Gifts is so egg-cited to announce a special Easter Day giveaway! We’re hopping into the Easter spirit by giving away one of our favorite Easter gifts. 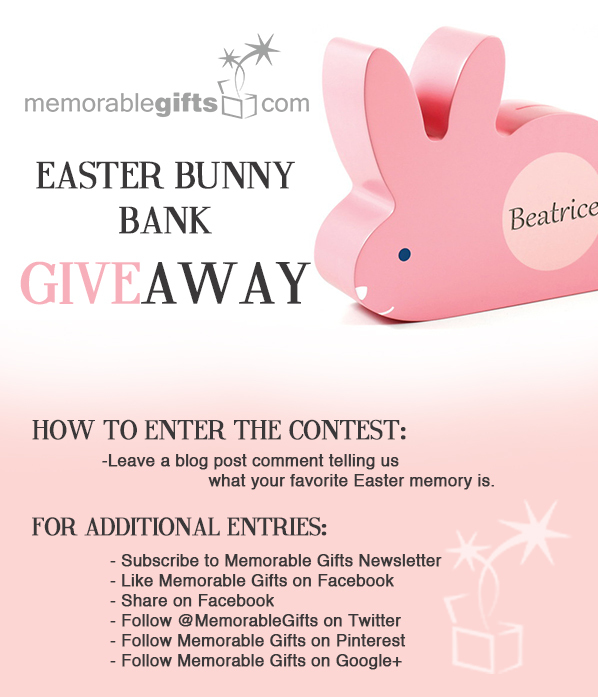 Don’t miss your chance to win an adorable personalized bunny bank. Memorable Gifts wishes you and your loved ones a truly happy Easter! To enter the Easter Day contest leave a blog post comment telling us what your favorite Easter memory is and simply fill out the Rafflecopter form below. Please only one entry per person/email/IP. All entries will be verified and the winner will be selected at random on April 20th. The winner will be contacted on April 21st via email and has 48 hours to respond or another winner will be drawn. Contest ends on April 20th, 2014 at 11:59PM. Good luck! Growing up, my family’s big easter tradition was to hide easter baskets (the whole, big thing!) around the house and we had to find them. My parents would give intentionally horrible clues (ex. “There’s no way in the world you’re going to find it!” if it was inside the globe, etc.) We thought it was pretty fun. Visiting my parents and having all the cousins hunting for Easter baskets. They were nearly impossible to find.